After the rocky road of the test-based accountability era, the next stage of education reform seemed to promise a smoother ride. 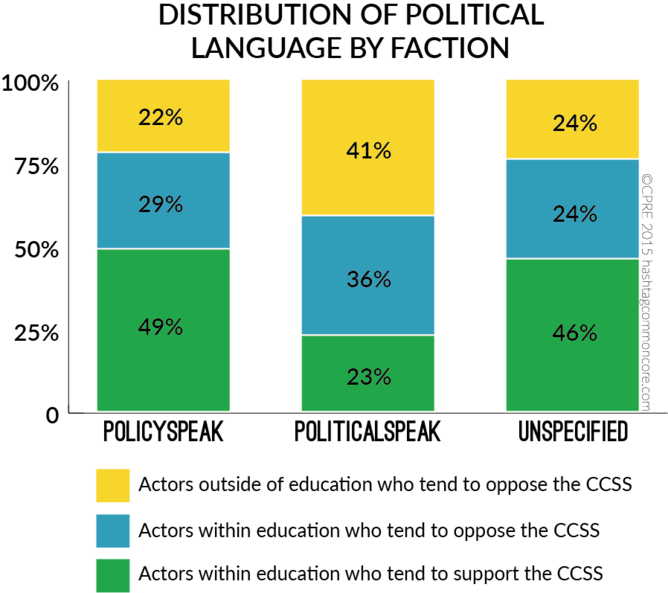 In 2010 the Common Core State Standards (CCSS), which set off high expectations for student academic performance in mathematics and English language arts, were adopted in 45 of the 50 states with strong bi-partisan support. Since then, however, public approval of the CCSS has both declined and become more divisive. The Common Core is now at the epicenter of a heated political debate, with social media as one of the battlefields. There are upwards of 40,000 tweets using #commoncore each month right up to the present. Although public discussions of education reform are part of America’s rich democratic history, their spillover into social media, on this scale, is unprecedented. For the first time, education policy is playing out online as much as it is in professional corridors. To examine the CCSS debate on Twitter, my colleagues Alan Daly from the University of California, San Diego and Miguel Del Fresno from The National University of Distance Education (UNED) in Madrid, Spain, and I collected almost 190,000 tweets from 53,000 people using the twitter hashtag #commoncore for six months from September 2013 through February 2014. 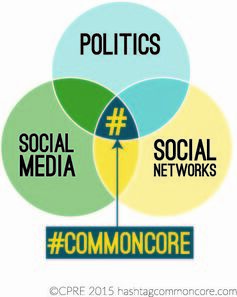 First, our analysis of the social network using #commoncore revealed the emergence of three distinct sub-communities. One group was largely made up of CCSS supporters; another distinct group was made up of individuals largely from within the education sector who opposed the CCSS. The final, and largest group, was made up of individuals and groups from outside of education who opposed the CCSS. Second, we found the CCSS debate was really a proxy war over broader cultural disagreements on the future direction of American education. Interestingly,very few tweets were about the standards themselves. Most were focused on other education issues that the standards have come to represent. Opposition to a federal role in education. A belief that the CCSS provide access to data on children that can be used for exploitative purposes. A source for over-testing children. A way for business interests to exploit public education for private gains. A belief that an emphasis on standards distracts from the deeper underlying causes of low educational performance, including poverty and social inequity. Third, in a deeper analysis of the language of the tweets themselves, we noticed two dominant rhetorical approaches. One used more rational, analytical language, which we dubbed “policyspeak”. The other approach we called “politicalspeak” as it employed more emotional language. We found that supporters of the CCSS were more likely to use the policyspeak language, while opponents were more likely to use politicalspeak. These approaches most likely were meant to appeal to different audiences. Significantly, there was strong media presence in the #commoncore network and evidence that the topics and messages were transported from this space into the mainstream media. We believe this study shines new light on how social media-enabled social networks are changing the dynamics of a political environment in which public policy is formulated. 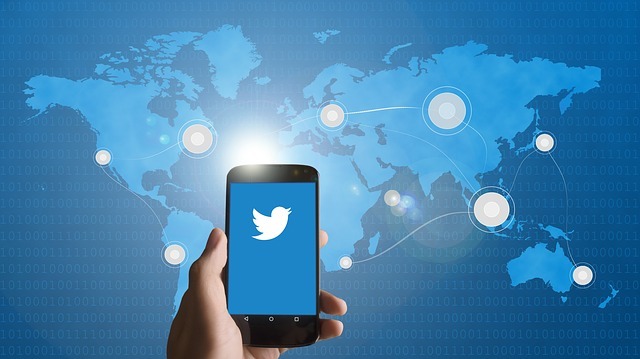 While it may seem that social media and the internet have been ever present, consider that the last major federal education policy initiative, the No Child Left Behind (NCLB) Act of 2001 was enacted three years before Facebook was first liked; four years prior to the first YouTube video, and five years before the first tweet on Twitter. We believe, for the first time, a new “activist public” are jockeying with more traditional advocacy groups through the social media for attention in the policy arena. Related to this is how media has evolved over the last half century: first from a passive system dominated by a few central opinion-makers; then to a splintered proliferation of more partisan media outlets; and now into a more active phase of social media in which we are the media, where individuals are not just the consumers but producers and perpetuators of what is news and dominant opinion. Finally, these analyses are a reminder that we live in a social world in which our understanding is derived from a complex set of interdependent social processes in which the diffusion of ideas, beliefs and opinions are stretched across individuals and multiple levels of an inter-related system.